When Emory held a grand opening for the university’s new WaterHub wastewater facility two years ago, it highlighted the goal of reducing campus water consumption and costs by reclaiming and recycling hundreds of thousands of gallons of wastewater for non-potable uses on campus. Since then, the award-winning facility has done just that — reducing potable water use on campus by more than 100 million gallons since its April 2015 grand opening, a landmark achievement realized well ahead of schedule. Constructed with sustainability in mind, the WaterHub is an on-campus water recycling system that utilizes eco-engineering processes to clean wastewater for non-potable use. The first system of its kind in the United States, it has drawn both international attention and accolades, attracting over 1,000 visitors and more than a dozen state, regional and national awards. The innovative facility has the capability to clean and recycle up to 400,000 gallons of wastewater per day, displacing nearly 40 percent of Emory's total campus water needs and reducing the demand upon Atlanta’s stressed watershed. On campus, the recycled water is primarily used for heating, cooling and toilet flushing. “Achieving the mark of recycling 100 million gallons of water is amazing,” Early says. 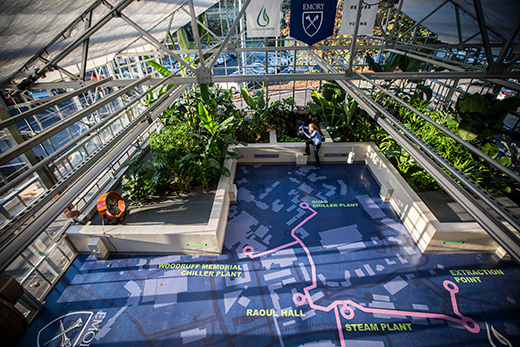 As projected, the reclamation system has dramatically displaced external water demand at Emory’s steam and chiller plants, which heat and cool campus buildings, creating an overall cost savings for the university. Once treated, the WaterHub supply is used for campus applications that don’t require drinking-water quality. That frees potable water for other community demands, Early notes. It appears that the system may also help hold down future campus construction costs, Early says. For new building projects, DeKalb County watershed requirements now demand the creation of retention vaults to accommodate peak sewer discharge — a change that could have heightened costs for the construction of Emory’s new Campus Life Center (CLC), projected to open in May 2019. When Early realized that the university was already retaining ample sewer water through WaterHub recycling, he spoke with DeKalb County officials, who agreed that the facility qualifies to offset new water vault requirements for the CLC and other upcoming building projects. “That’s an unexpected positive and a great outcome,” says Early. In fact, the only real challenge with the facility has been “learning more about the quality of water needed for our boiler, which is quite high,” he explains, adding that plans call for expanding recycled water use into additional campus residence halls for toilet flushing in the near future. The WaterHub has also proven to be an important drawing card for academic and community interests. Since opening, the facility has actively supported hands-on faculty and student research. “The WaterHub helps fulfill Emory’s vision to use the campus as a living laboratory and marries our operational and academic work in innovative ways,” says Ciannat Howett, director of sustainability initiatives at Emory. Beyond creating classroom and community engagement opportunities for Emory faculty and students, the WaterHub has drawn the attention of other universities, local and national government agencies, and even Fortune 500 companies. In other campus energy developments, Emory is expanding its role into power production through the installation of a steam turbine generator within its boiler system. When one of the massive campus boilers had to be replaced last year, “our team saw a perfect opportunity to add a steam turbine to the boiler project,” Early says. Combined, Emory’s self-generated solar and steam-turbine equipment generate up to 1.25 megawatts of energy a day — solar panels on the WaterHub alone have produced more than 15,320 kilowatt-hours of power since May 2015. Peak summer demand on campus averages about 45 megawatts a day, says Joan Kowal, senior director of energy and utilities for Campus Services. With the upcoming construction of the CLC, Emory also plans its first foray into the realm of geothermal energy. “We’ll be drilling wells in McDonough Field that essentially use the Earth as a heat sink to help cool and heat buildings,” Early says. Early notes that the university continues to make good progress on its goal of reducing campus energy consumption per square foot by 50 percent and total energy use by 25 percent, as outlined in Emory’s Sustainability Vision and Strategic Plan.